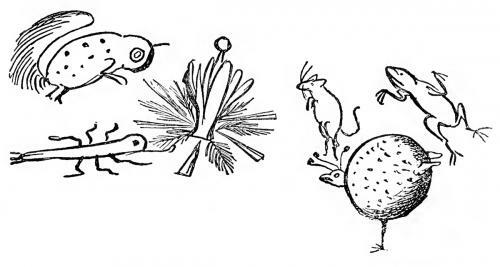 The History of the Seven Families of the Lake Pipple-Popple | Edward Lear: Two Hundred Years of Nonsense! In former days,—that is to say, once upon a time,—there lived in the Land of Gramble-Blamble seven families. They lived by the side of the great Lake Pipple-Popple (one of the seven families, indeed, lived in the lake), and on the outskirts of the city of Tosh, which, excepting when it was quite dark, they could see plainly. The names of all these places you have probably heard of; and you have only not to look in your geography-books to find out all about them. Now, the seven families who lived on the borders of the great Lake Pipple-Popple were as follows in the next chapter. There was a family of two old Parrots and seven young Parrots. There was a family of two old Storks and seven young Storks. There was a family of two old Geese and seven young Geese. There was a family of two old Owls and seven young Owls. There was a family of two old Guinea Pigs and seven young Guinea Pigs. There was a family of two old Cats and seven young Cats. And there was a family of two old Fishes and seven young Fishes. The Parrots lived upon the Soffsky-Poffsky trees, which were beautiful to behold, and covered with blue leaves; and they fed upon fruit, artichokes, and striped beetles. 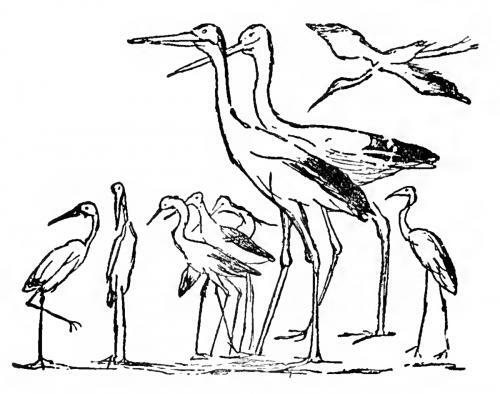 The Storks walked in and out of the Lake Pipple-Popple, and ate frogs for breakfast, and buttered toast for tea; but on account of the extreme length of their legs they could not sit down, and so they walked about continually. The Geese, having webs to their feet, caught quantities of flies, which they ate for dinner. The Owls anxiously looked after mice, which they caught, and made into sago-puddings. The Guinea Pigs toddled about the gardens, and ate lettuces and Cheshire cheese. The Cats sate still in the sunshine, and fed upon sponge biscuits. The Fishes lived in the lake, and fed chiefly on boiled periwinkles. And all these seven families lived together in the utmost fun and felicity. One day all the seven fathers and the seven mothers of the seven families agreed that they would send their children out to see the world. So they called them all together, and gave them each eight shillings and some good advice, some chocolate-drops, and a small green morocco pocket-book to set down their expenses in. They then particularly entreated them not to quarrel; and all the parents sent off their children with a parting injunction. "If," said the old Parrots, "you find a cherry, do not fight about who should have it." "And," said the old Storks, "if you find a frog, divide it carefully into seven bits, but on no account quarrel about it." 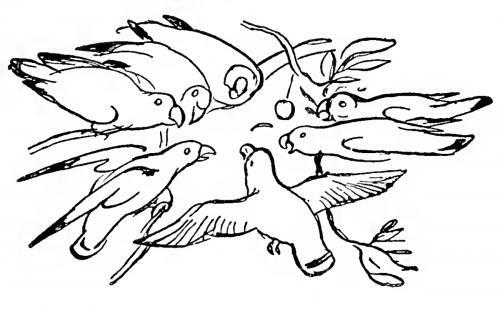 And the old Geese said to the seven young Geese, "Whatever you do, be sure you do not touch a plum-pudding flea." And the old Owls said, "If you find a mouse, tear him up into seven slices, and eat him cheerfully, but without quarrelling." And the old Guinea Pigs said, "Have a care that you eat your lettuces, should you find any, not greedily, but calmly." And the old Cats said, "Be particularly careful not to meddle with a clangle-wangle if you should see one." And the old Fishes said, "Above all things, avoid eating a blue boss-woss; for they do not agree with fishes, and give them a pain in their toes." So all the children of each family thanked their parents; and, making in all forty-nine polite bows, they went into the wide world. and screamed, and shrieked, and squealed, and squeaked, and clawed, and snapped, and bit, and bumped, and thumped, and dumped, and flumped each other, till they were all torn into little bits; and at last there was nothing left to record this painful incident except the cherry and seven small green feathers. 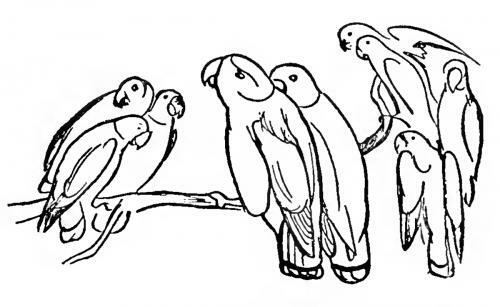 And that was the vicious and voluble end of the seven young Parrots. 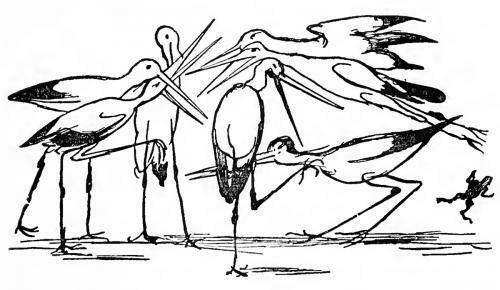 When the seven young Storks set out, they walked or flew for fourteen weeks in a straight line, and for six weeks more in a crooked one; and after that they ran as hard as they could for one hundred and eight miles; and after that they stood still, and made a himmeltanious chatter-clatter-blattery noise with their bills. About the same time they perceived a large frog, spotted with green, and with a sky-blue stripe under each ear. flatter-quatter, more violently than ever; and after they had fought for a week, they pecked each other all to little pieces, so that at last nothing was left of any of them except their bills. And that was the end of the seven young Storks. When the seven young Geese began to travel, they went over a large plain, on which there was but one tree, and that was, a very bad one. So four of them went up to the top of it, and looked about them; while the other three waddled up and down, and repeated poetry, and their last six lessons in arithmetic, geography, and cookery. Presently they perceived, a long way off, an object of the most interesting and obese appearance, having a perfectly round body exactly resembling a boiled plum-pudding, with two little wings, and a beak, and three feathers growing out of his head, and only one leg. So, after a time, all the seven young Geese said to each other, "Beyond all doubt this beast must be a Plum-pudding Flea!" And listen, oh! listen, oh! listen to me!" And no sooner had they sung this verse than the Plum-pudding Flea began to hop and skip on his one leg with the most dreadful velocity, and came straight to the tree, where he stopped, and looked about him in a vacant and voluminous manner. On which the seven young Geese were greatly alarmed, and all of a tremble-bemble: so one of them put out his long neck, and just touched him with the tip of his bill; but no sooner had he done this than the Plum-pudding Flea skipped and hopped about more and more, and higher and higher; after which he opened his mouth, and, to the great surprise and indignation of the seven Geese, began to bark so loudly and furiously and terribly, that they were totally unable to bear the noise; and by degrees every one of them suddenly tumbled down quite dead. So that was the end of the seven young Geese. When the seven young Owls set out, they sate every now and then on the branches of old trees, and never went far at one time. And one night, when it was quite dark, they thought they heard a mouse; but, as the gas-lamps were not lighted, they could not see him. So they called out, "Is that a mouse?" On which a mouse answered, "Squeaky-peeky-weeky! yes, it is!" And immediately all the young Owls threw themselves off the tree, meaning to alight on the ground; but they did not perceive that there was a large well below them, into which they all fell superficially, and were every one of them drowned in less than half a minute. So that was the end of the seven young Owls. Lettuce, O let us, lettuce-leaves!" 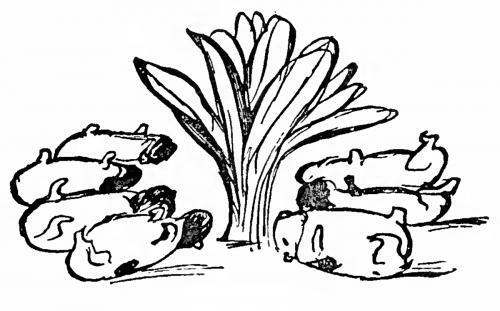 And instantly the seven young Guinea Pigs rushed with such extreme force against the lettuce-plant, and hit their heads so vividly against its stalk, that the concussion brought on directly an incipient transitional inflammation of their noses, which grew worse and worse and worse and worse, till it incidentally killed them all seven. And that was the end of the seven young Guinea Pigs. The seven young Cats set off on their travels with great delight and rapacity. But, on coming to the top of a high hill, they perceived at a long distance off a Clangle-Wangle (or, as it is more properly written, Clangel-Wangel); and, in spite of the warning they had had, they ran straight up to it. 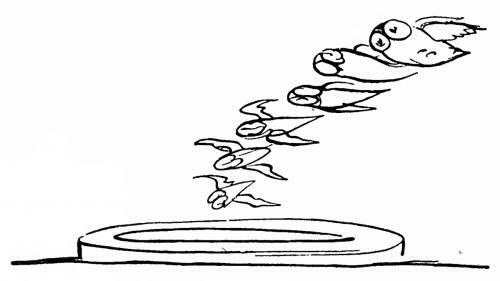 The moment the Clangle-Wangle saw the seven young Cats approach, he ran away; and as he ran straight on for four months, and the Cats, though they continued to run, could never overtake him, they all gradually died of fatigue and exhaustion, and never afterwards recovered. And this was the end of the seven young Cats. circular depth of soft mud; where, in fact, his house was. And the seven young Fishes, swimming with great and uncomfortable velocity, plunged also into the mud quite against their will, and, not being accustomed to it, were all suffocated in a very short period. And that was the end of the seven young Fishes. were all dead, then the Frog, and the Plum-pudding Flea, and the Mouse, and the Clangle-Wangle, and the Blue Boss-Woss, all met together to rejoice over their good fortune. And they collected the seven feathers of the seven young Parrots, and the seven bills of the seven young Storks, and the lettuce, and the cherry; and having placed the latter on the lettuce, and the other objects in a circular arrangement at their base, they danced a hornpipe round all these memorials until they were quite tired; after which they gave a tea-party, and a garden-party, and a ball, and a concert, and then returned to their respective homes full of joy and respect, sympathy, satisfaction, and disgust. became aware, by reading in the newspapers, of the calamitous extinction of the whole of their families, they refused all further sustenance; and, sending out to various shops, they purchased great quantities of Cayenne pepper and brandy and vinegar and blue sealing-wax, besides seven immense glass bottles with air-tight stoppers. And, having done this, they ate a light supper of brown-bread and Jerusalem artichokes, and took an affecting and formal leave of the whole of their acquaintance, which was very numerous and distinguished and select and responsible and ridiculous. And after this they filled the bottles with the ingredients for pickling, and each couple jumped into a separate bottle; by which effort, of course, they all died immediately, and became thoroughly pickled in a few minutes; having previously made their wills (by the assistance of the most eminent lawyers of the district), in which they left strict orders that the stoppers of the seven bottles should be carefully sealed up with the blue sealing-wax they had purchased; and that they themselves, in the bottles, should be presented to the principal museum of the city of Tosh, to be labelled with parchment or any other anti-congenial succedaneum, and to be placed on a marble table with silver-gilt legs, for the daily inspection and contemplation, and for the perpetual benefit, of the pusillanimous public. And if you ever happen to go to Gramble-Blamble, and visit that museum in the city of Tosh, look for them on the ninety-eighth table in the four hundred and twenty-seventh room of the right-hand corridor of the left wing of the central quadrangle of that magnificent building; for, if you do not, you certainly will not see them.